March 15, 2016 – NASA successfully tested the first deep space RS-25 rocket engine for 500 seconds March 10, clearing a major milestone toward the next great era of space exploration. The next time rocket engine No. 2059 fires for that length of time, it will be carrying humans on their first deep-space mission in more than 45 years. 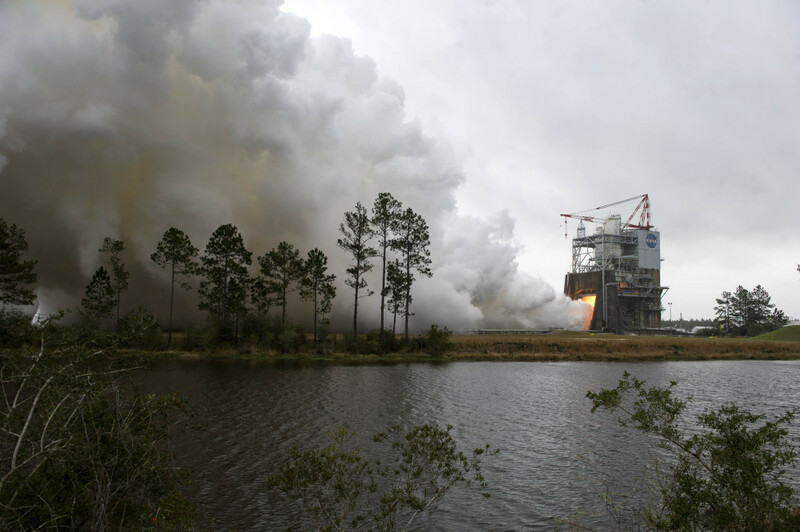 The hot fire marked the first test of an RS-25 flight engine for NASA’s new Space Launch System (SLS), being built to carry humans on future deep-space missions, including an asteroid and Mars. Four RS-25 engines will help power the SLS core stage. NASA and Aerojet Rocketdyne, the prime contractor for RS-25 engine work, conducted a series of developmental tests on the RS-25 engine last year at Stennis, primarily to validate the capabilities of a new controller – or, “brain” – for the engine and to verify the different operating conditions needed for the SLS vehicle. Following today’s firing, Stennis and Aerojet Rocketdyne will conduct a development engine series to test new flight engine controllers and will continue to test RS-25 flight engines. In addition, the agency is preparing the B-2 Test Stand at Stennis to test the SLS core stage that will be used on the rocket’s first flight, Exploration Mission-1. Testing will involve installing the flight core stage on the B-2 stand and firing its four RS-25 rocket engines simultaneously.